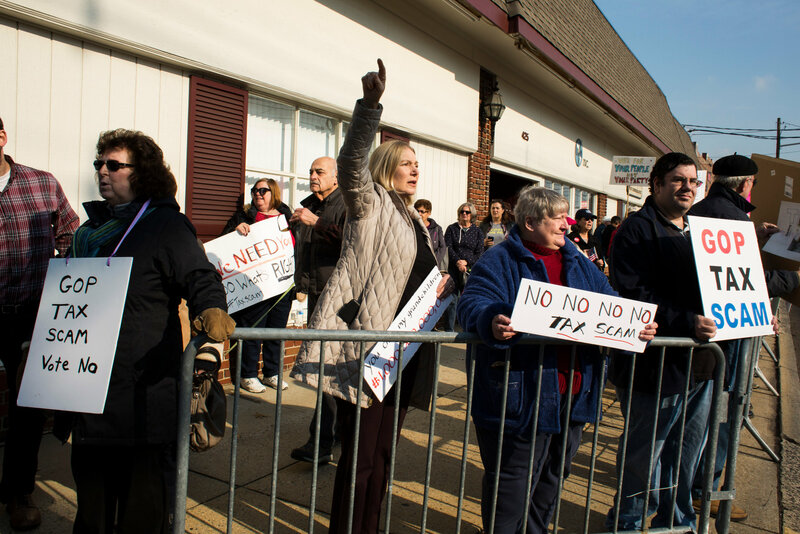 Protesters rallied outside the Westfield, N.J., office of Representative Leonard Lance on Monday. Throughout his 17-month campaign, Philip D. Murphy, the governor-elect of New Jersey and a Democrat, made promise after promise to voters: to fully fund the state’s floundering transportation network, fully fund its underfunded schools and to fully fund the underfunded public pension system, all part of a far-reaching progressive agenda that led to a 14-point victory in last month’s election. Essential to Mr. Murphy’s agenda was a so-called “millionaire’s tax’’ to be levied on the state’s wealthiest residents. After the election, Mr. Murphy and his allies in the Democratic-controlled State Legislature made passing the tax their top priority when he takes office in January. But now the federal tax bill passed by the Senate, which takes aim at high-tax and Democratic-leaning states like New Jersey, is threatening both House Republicans from New Jersey, who will be pressed to vote on a measure that will harm their constituents, as well as the state’s Democratic agenda. While Mr. Murphy has remained adamant that state lawmakers press ahead on the tax on the wealthy, Stephen M. Sweeney, the State Senate president, and Craig Coughlin, the incoming Assembly speaker, have both said that they want to reassess the wisdom of pursuing a new tax when so many residents are facing the prospect of far higher tax bills. New Jersey would be one of the hardest hit states under the Senate’s tax bill, in large part because it eliminates the deduction for state and local income taxes and limits the deduction for property taxes to $10,000. New Jersey ranks fourth among states with the highest average deductions for households earning $200,000 or more, and two of its counties are in the top 12 in the country for the highest average amount claimed in state and local tax deductions. In a conference call with Gov. Andrew M. Cuomo of New York and Gov. Jerry Brown of California, both Democrats, Mr. Murphy said that more than a quarter of New Jersey residents pay over $10,000 in annual property taxes. The three governors vowed to fight the bill, including possibly filing a lawsuit, though details beyond that were murky. But it is the direct hit to residents in New Jersey that has made Mr. Coughlin and Mr. Sweeney hesitate. “What I’ve said about the millionaire’s tax, as I want to do with all of the things we do, I want to have a thorough and thoughtful process about how we go about handling challenging issues, and what happens in Washington might have an impact in New Jersey,” Mr. Coughlin said. During the campaign, Mr. Murphy estimated that raising taxes on the highest earners would yield about $700 million in revenue that could be used to help fund public schools and provide property tax relief in New Jersey, which has the highest property taxes in the country. Mr. Murphy believes the political pressure should not fall on him to drop his tax proposal, but on Republican members of Congress in New Jersey who need to work to amend the Senate bill as it is reconciled with the House version before a final vote. Protesters seemed to share Mr. Murphy’s opinion and focused on the state’s five Republican congressman. Dozens of protesters gathered on Monday outside the offices of all the Republican representatives to express their anger at the bill, even though only one Republican, Representative Tom MacArthur, voted for the House version of the tax bill. The largest protests were at the offices of two Republicans in the northern part of the state — Representatives Leonard Lance and Rodney Frelinghuysen — who voted against the bill, signaling that Republicans, no matter where they stand, will be tied to the tax plan in next year’s elections. On Tuesday, Mr. Lance teamed up with Representative Josh Gottheimer, a Democrat from northern New Jersey, to announce a proposal to save the state and local tax deduction, known as SALT. Mr. Lance, who represents a wealthy, suburban district in northern New Jersey, also said he was not worried about whether the tax bill could harm his re-election chances.